Director Obi Emelonye probably earned the right to make ‘Onye ozi’ – translated as The Messenger- , an ultra-low budget independent film in Igbo language after enjoying back to back success with his last 2 efforts. 2011’s ‘The Mirror boy’, followed a year later by ‘Last flight to Abuja’ impressed not a few with the stunning mix of imagery, special effects, star power and good old story telling. While both films were deeply flawed, they managed to present novel concepts and Emelonye became a mainstay of the award shows circuit. 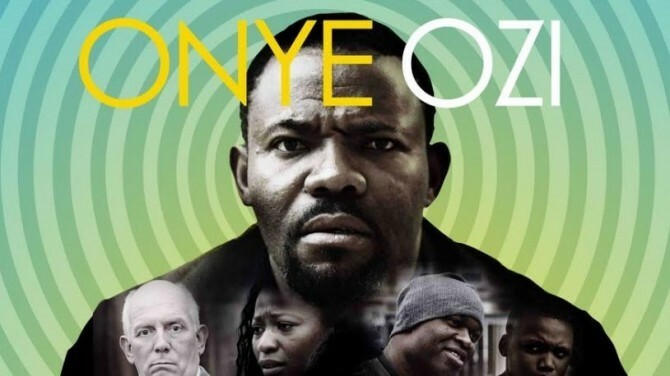 He leverages on his recently minted clout to cobble together ‘Onye ozi’, a sort of fish out of water comedy about a hustler Metumaribe (Okey Bakassi) who finally gets into the United Kingdom after multiple tries and multiple rejections. The process of obtaining a UK visa is aided significantly by a Nigerian girlfriend he has been communicating with and whom intends to marry him once he settles down to life abroad. Only once he arrives, things don’t quite work out as planned. Getting a job does not come as easy as he envisaged and he wakes up slowly to the realisation that absolutely no one abroad gives a hoot about his Bahelors degree- in Political science none the less- . To top it all, said girlfriend has a few secrets of her own and then in a cruel twist of fate he finds himself caught in the middle of a murder mystery with a supernatural twist. Again Emelonye attempts to buck the trends and keep up with himself as no two of his movies can be said to be similar plotwise. What they have in common however, beyond the unusual circumstances of the characters is a simple quest for survival. Metumaribe is a young man, representative of the thousands, maybe millions of young Nigerians in foreign countries who want to survive. And they will do whatever needs to be done. At first, Metumaribe is unwilling but as his immediate circumstances dictate, he has little to decide as his fate has already been outlined for him. He only has to see it out till the ridiculous happy ending which the screenplay has already decided on from the beginning. ‘Onye Ozi’ is a film set in London but peopled by characters with dyed in the wool Igbo names such as Metumaribe and Mkpuruoma. It has its moments of genuine comic timing even while the supernatural is ratcheted up to incredible levels. Everyone speaks Igbo here even the white men who were obviously raised in London. Emelonye sets up a parallel London universe where even the policemen are able to converse in Igbo. Lots of it is unpleasant to the ears but at least the attempt is heartwarming at best. Okey Bakassi returns from his career detour as a politician’s aide and carries the film ctredibly, delivering a performance that grounds the plot even while the inconsistencies are piling up. He reminds us of his bonafide leading man talents and impeccable comic timing. Ngozi Igwebike, the lady who plays his love interest keeps up with him and announces her presence forcefully, such that you want to see more of her after this movie. No fake airs for her, she is proudly Igbo and rocks her origins. Sadly a couple of the supporting acts have no business being in front of a camera but considering they were all probably working for next to nothing, the producers can only get what they put in. plus having to deliver in comprehensible Igbo probably did little to help. The special effects were not impressive and the stunt work could have been better handled. The real pleasures of the film come from watching Okey Bakassi and Igwebike go back and forth as they do everything else but accept the fact that they are all the other’s got. The film has the chap look of being short by a hand held camera and the picture quality shows that everything is on a budget. Do not go into ‘Onye Ozi’ expecting much and you may find yourself liking what you see.